Why The Crisis Between Ukraine And Russia Has Taken To The Sea It's not by chance that the countries' 4 1/2-year conflict has taken on a naval dimension. Moscow is further imposing on Kiev its annexation of Crimea. Ukrainian President Petro Poroshenko speaks to soldiers during a visit to a military base in Chernihiv region, Ukraine, on Wednesday. 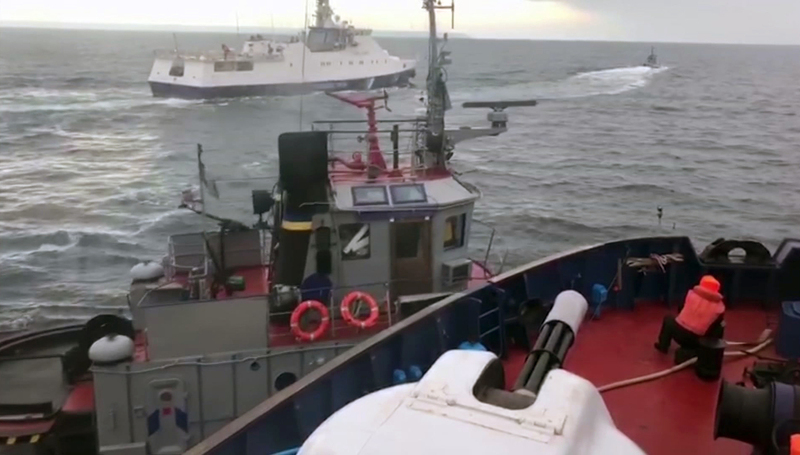 Russia and Ukraine traded blame after Russian border guards on Sunday opened fire on three Ukrainian navy vessels and eventually seized them and their crews. The incident put the two countries on a war footing and raised international concern. In late September, the Ukrainian navy announced that two of its vessels had successfully traveled from the Black Sea to the Sea of Azov, passing through waters controlled by the Russian "aggressor" and exercising Ukraine's maritime rights under international law. Crimea, which Russia seized in 2014, is shown with stripes on the map. A Ukrainian news channel hailed the move as "a brilliant and risky operation under the enemy's nose," while Russian media mocked the "rusty" ships that had "crawled" past the Crimean Peninsula. 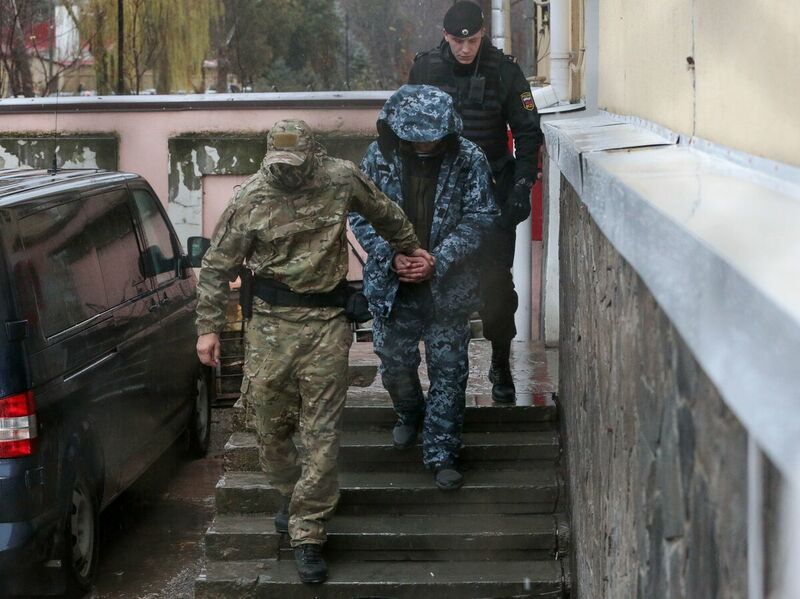 A detained Ukrainian sailor is escorted to a car after a court hearing in Simferopol, Crimea, on Wednesday. On Sunday, Russian forces fired on, boarded and captured three of Ukraine's boats. It is not by chance that the 4 1/2-year conflict between Ukraine and Russia has taken on a naval dimension. For Kiev, keeping the Sea of Azov open to its ships is more than just a matter of legal principle — it's a strategic and economic imperative. For the Kremlin, the challenge posed by Ukraine's tiny navy is almost entirely symbolic. The new Crimean Bridge connects southern Russia's Krasnodar region with the Crimean Peninsula, spanning the strait between the Black Sea and the Sea of Azov. 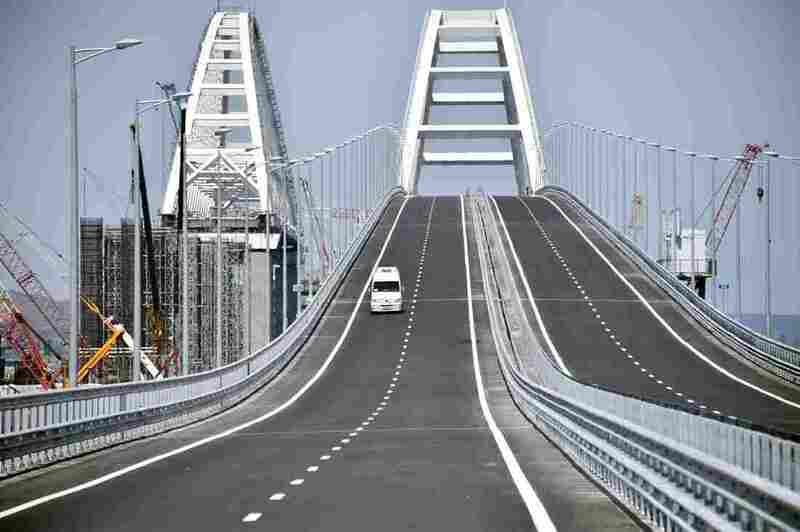 Putin's bridge is a symbol of Russia's claim on Crimea. Since Sunday's skirmish, it has also become the physical gateway to the Sea of Azov. To prevent the three Ukrainian boats from passing under the bridge, Russia placed a cargo ship below it. 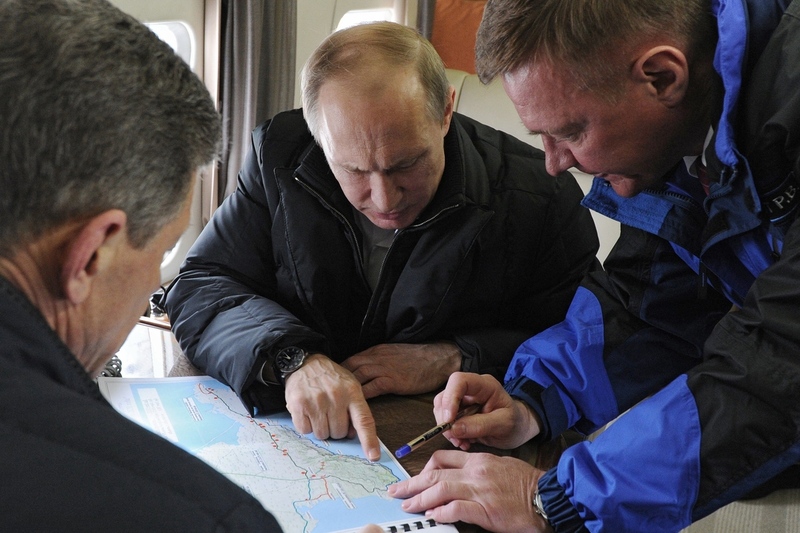 Russian President Vladimir Putin (center), aboard a helicopter, points at a map while inspecting the site for a bridge across the Kerch Strait in March 2016. Today, the bridge links Russia and the Crimean Peninsula. "Russia's purpose is to occupy the Azov Sea, the same way it did Crimea. This is a brutal violation of international law, and we cannot accept it," Ukrainian President Petro Poroshenko told The Washington Post in September. "We have absolutely clear legal status in the Azov Sea. Russia has no right to attack or stop our vessels." When the first two Ukrainian naval boats passed under the Kerch bridge to the Sea of Azov that same month, Poroshenko thanked the crews for a "perfectly executed order" and said the two aging vessels would be stationed at the new base. A few days later, Poroshenko traveled to Baltimore to officially receive two U.S. Coast Guard patrol boats that will be delivered to Ukraine next year. Putin justified Russia's takeover as the free choice of Russian-speaking Crimeans who feared Ukrainian nationalists coming to power after street protests in Kiev brought down a Kremlin-backed government. Putin also said he couldn't countenance the presence of "NATO sailors" in Sevastopol should Ukraine one day join the U.S.-led alliance. An image from video released by Russia's Federal Security Service taken from a Russian coast guard vessel shows an incident between the Russian coast guard and a Ukrainian tugboat in the Kerch Strait on Nov. 25. Ukraine's navy estimates it lost at least 80 percent of its assets and capabilities after the annexation of Crimea, as its most important bases were located on the peninsula. Russia's seizure of the two gunboats on the weekend is a further blow. After the clash, Poroshenko called Russia's actions at sea "a new stage of aggression." If Russia's war against Ukraine had previously been clandestine, he said, Sunday's incident was an open attack. 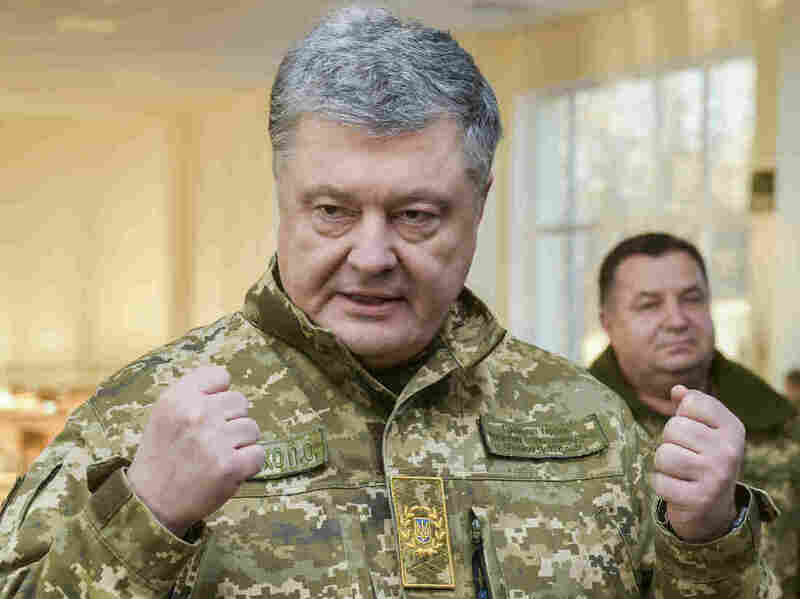 Poroshenko warned that new intelligence suggested "an extremely serious threat of a land-based operation against Ukraine" that warranted the imposition of martial law. Domestic opponents of the unpopular president accused him of planning to use martial law as a way to suspend an election scheduled for March 31. Poroshenko only got Ukraine's boisterous parliament to approve the measure once he had watered down his proposal by reducing martial law — which entered into force Wednesday — to 30 days from 60, limiting it to border regions and promising not to postpone the election. Sonya Koshkina, the editor of the Kiev news site lb.ua, wrote that Poroshenko's lack of transparency in pushing through martial law had increased "the gap between the government and the Ukrainian people." Ukrainian journalist Maxim Eristavi warned that martial law itself could crush Ukraine's fledgling democracy. While Putin blamed Poroshenko for a pre-election "provocation" to boost his sagging popularity, the flare-up in tensions doesn't exactly hurt the Russian president domestically either. After his triumphant re-election to a fourth term in March, Putin's approval ratings have taken a hit amid anger over the government's raising of the retirement age, rising fuel prices and tax hikes. The portion of Russians who say they trust Putin has dropped 20 percentage points to 39 percent within less than a year, according to the independent Levada Center. His popularity was at an all-time high after the annexation of Crimea. Ukraine's biggest problem in its struggle with its giant neighbor is keeping the world's attention — especially that of the United States. While the leaders of NATO, the European Union and Germany spoke out against Russia's seizure of the Ukrainian boats and their crews, President Trump left it to his ambassador to the United Nations, Nikki Haley, to condemn the move as an "outrageous violation of sovereign Ukrainian territory." But in a White House briefing the next day, national security adviser John Bolton made no mention of any cancellation and indicated that Haley had spoken the administration's final word on the Kerch Strait incident.